The Perfect Gift is the one you can choose yourself! The recipient of this gift card will appreciate your thoughtful gift because they get to choose exactly the tools and accessories they want! You can even have it sent directly to the recipient; just enter their mailing information on the Shipping Address page. 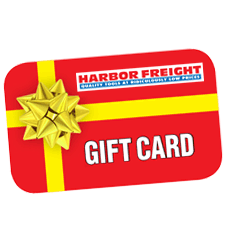 If you're ordering additional gift cards, please order each one separately to ensure timely delivery to the proper addresses. Good at our 1000+ stores nationwide and at www.HarborFreight.com. *Gift Cards are not subject to sales tax or standard delivery charges. Express Shipping Available - Select 2nd Day or Next Day Shipping during checkout. Additional fees apply.